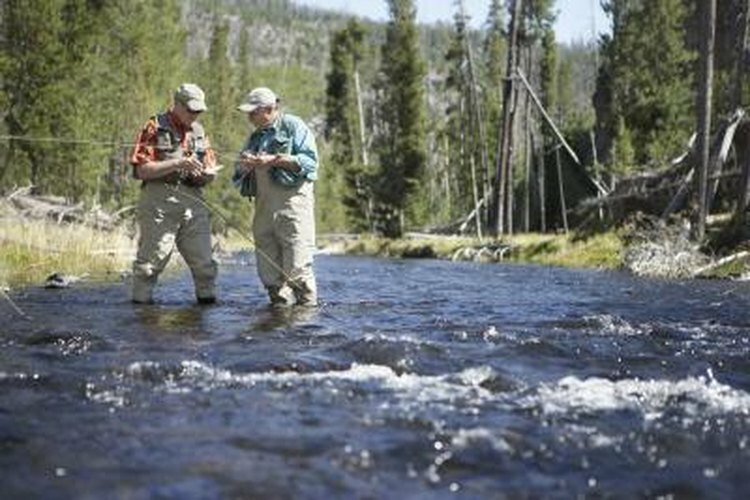 Two men preparing their lines while fly fishing in a river. The leader is a key component of a complete fly-fishing setup, designed to connect the thick, brightly-colored fly line to the nearly invisible tippet to which the fly is tied. A few knots can be used to tie the fly line to the leader. The most common of these is the nail knot. Early versions of this knot used an actual nail in the tying process, but today a length of hollow tube or straw makes the knot easier to tie. Hold the tube and the end of your fly line in your left hand so that about two inches of line stick out to the right. Lay the leader against the tube and fly line in the opposite direction, so that several inches of leader stick out to the left. Use your right hand to wrap the leader around both the straw and fly line from left to right, making about six complete turns. Then, pass the end of the leader through the tube from right to left. Gently remove the tube, and then wet the knot before pulling it tight and trimming the excess line. Another option for connecting the fly line to the leader is known as an Albright Knot. More commonly used for tying backing to fly line, this knot is slightly simpler to tie than the nail knot, but creates a less smooth finish that may cause resistance during casting.